President Isaias Afwerki held extensive discussions today in Abu Dhabi with Crown Prince Sheikh Mohammed bin Zayed Al-Nahyan. The talks centered on status, recent progress & measures that will be taken to enhance bilateral ties of friendship & cooperation between the two countries. 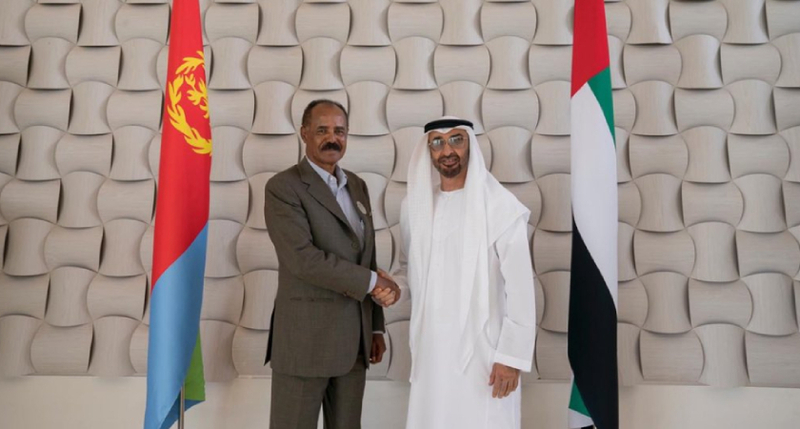 Sheikh Mohamed bin Zayed held talks with the President of Eritrea to further bolster links between the UAE and the African country. The Crown Prince of Abu Dhabi and Deputy Supreme Commander of the Armed Forces hosted Isaias Afwerki to discuss issues of mutual concern and ways to enhance levels of co-operation. It was just the latest in a series of meetings between the two men since Eritrea struck a peace deal with Ethiopia. Mr Afwerki and Ethiopian Prime Minister Abiy Ahmed agreed a peace deal last summer and later met in Abu Dhabi after years of conflict. The thaw in relations accelerated in June when Mr Abiy said Ethiopia would accept a UN-approved ruling, made after a two-year war, and also hand back disputed territory. Ethiopia and Eritrea re-established diplomatic relations in July and signed a Declaration of Peace and Friendship in the Eritrean capital Asmara. The UAE has supported efforts to forge peaceful relations between the countries.